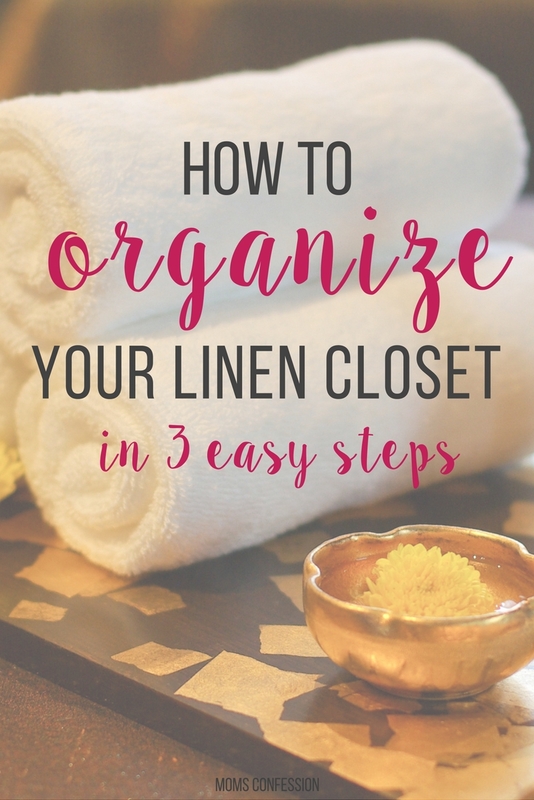 Here are my best tips for how to organize your linen closet. You’ll be able to easily find your towels, sheets, and even tablecloths in minutes. Plus, you won’t be embarrassed to open the door because you are afraid of the landslide of linens that might all out on you. Put your sheet sets inside their pillowcase. By far, one of the easiest ways to organize your sheets is to actually fold them and put them inside the pillowcase. This keeps each set together, so you won’t ever be standing in your linen closet struggling to find a matching set. It also keeps you from having to worry about folding that fitted sheet properly. If you have multiple sizes of sheets, one way to organize your linen closet, even more, is to label the shelf or use totes or bins to keep the different sizes separate and easy to grab. This makes it even easier for you to have your kids take care of their own linens instead of you having to locate them every time they need changing. Put seasonal items on the top shelf. Seasonal items are those things that you will rarely use, but still, want accessible. This can be the flannel sheets for winter or the holiday tablecloths. By using this method to organize your linen closet, you’ll always know exactly where to find those rarely used items. There will no longer be hours spent going through boxes in the attic or garage to find your holiday table decorations. Separate each season into categories making it even easier to manage. Small totes or baskets make this easy to manage. For some seasonal items, you may even want to invest in vacuum seal bags to save space and keep them all together for when they are needed later. Invest in the right storage systems. To organize your linen closet you want to make sure you are actually using the best storage options for your needs. For some families that will be simple shelves. For others, totes, bins, or storage bags are a better option. Don’t forget how important labeling everything is. It’s much easier to find what you need when things are labeled properly. For some, hanging tablecloths is a great way to keep wrinkles away. For others, these can be folded and ironed before use. There are great bins and totes for putting napkin rings. Many people enjoy folding their linens, but rolling them is quite efficient too. Not only does it look whimsical, but they take up little space this way and stay wrinkle-free. Give your linens a roll and just stack them up until they are needed. 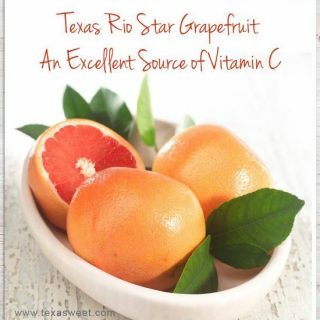 It works just as well for washcloths and hand towels too. Baskets can make anything look fancier. Whether in your bathroom or in a closet, a basket is great for keeping linens sorted and organized according to size and color. Don’t tear up all of your linens looking for one particular size. Instead, sort by sizes right after you fold so that you can easily grab for the one you need. Take a safety pin and pair sheet sets together along with pillowcases so that you are not digging for a match. This is a great way to grab what you need fast and keep the rest of your closet unscathed. A wine rack holds rolled up towels quite nicely, as do baskets, wire crates, and large flower pots. Get creative and find pretty ways to keep your linens stored neatly. Place a dish of baking soda in amongst your linens to avoid the smell of must or mildew. This way, your closet will not look organized and clean but smell nice and clean too. 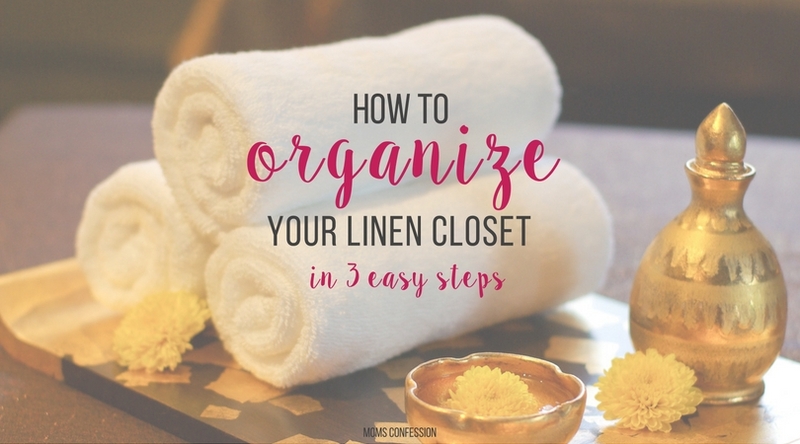 If you are working toward a more organized home, these tips for how to organize your linen closet are a great place to begin. You can easily begin with just one small place like your linen closet to make progress toward your home being easily organized. Give these tips a try and see how easy it is to get your linen closet looking good for less. You will be amazed at how easy it can be and how much time you can save! 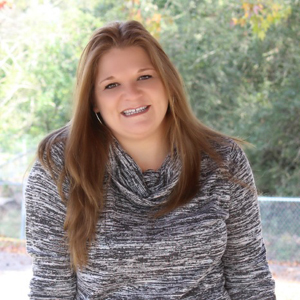 Follow Kristi @ Moms Confession’s board Organizing Tips for Home on Pinterest.